The Unionville High School Marching Band parades down Main Street USA at Disney World last week. LAKE BUENA VISTA, Fla. — Under unusually warm and sunny skies, music students from Unionville High School wowed attendees at Walt Disney World with a series of performances by musicians and singers from the school Wednesday through Friday, last week. The school’s music program made its semi-regular trip (typically every four years) to allow students to perform at various venues around the Florida resort/theme park complex. Those students who participated spent a number of months both in raising the funds for the trip as well as rehearsing their material, which must meet exacting standards as set by Disney. 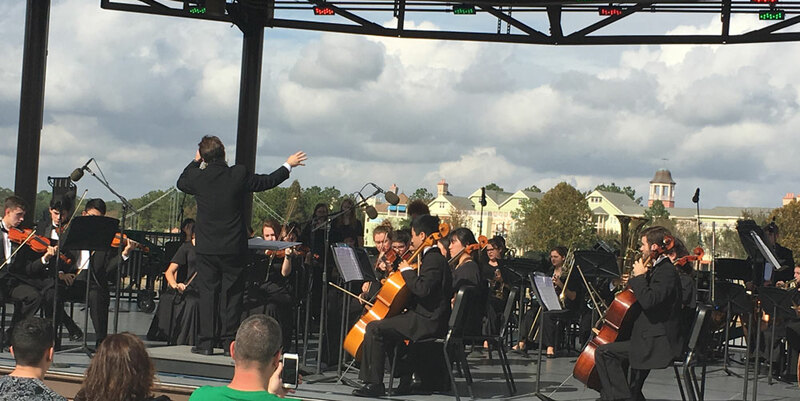 The Unionville High School Orchestra performs at Disney Springs, Thursday. 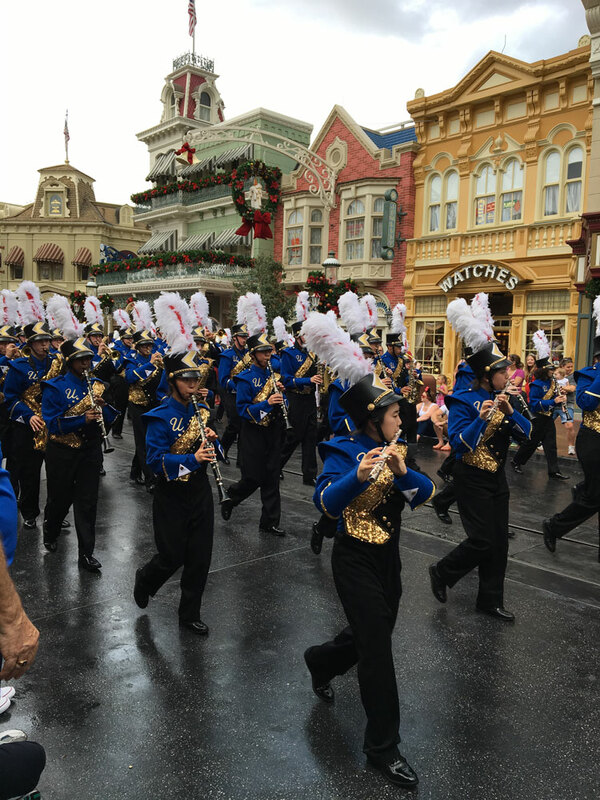 Unionville High School’s Marching Band kicked off the performances, Wednesday afternoon, with a spirited pre-parade march down Main Street USA in the Magic Kingdom. Although there had been intermittent rain on a warm, humid, summer-like day, the rains stopped in time for the Unionville performance, which was warmly received by the thousands of folks lining the parade route. Whether it was an omen or not, a bit later, a large, well-defined rainbow appeared over the Magic Kingdom, just minutes after Unionville completed its performance. On Thursday, both the school’s Orchestra and Jazz Band played — back to back — in a scenic, waterfront venue in Disney Springs. The weather was again warm, but dry, even as a few dark clouds broke up the mostly blue skies as the musicians took the stage. New music teacher — and Orchestra Director — Leo Zumpetta led his charges through a spirited set of holiday classics in front of a large and appreciative crowd. The Unionville High School Jazz band performs at Disney Springs, Thursday. The Jazz Band, under the direction of G. Scott Litzenberg, cranked things to an even higher level, wowing the crowd with a mix of jazz and holiday numbers that were exceptional, earning a well deserved standing ovation from the audience. 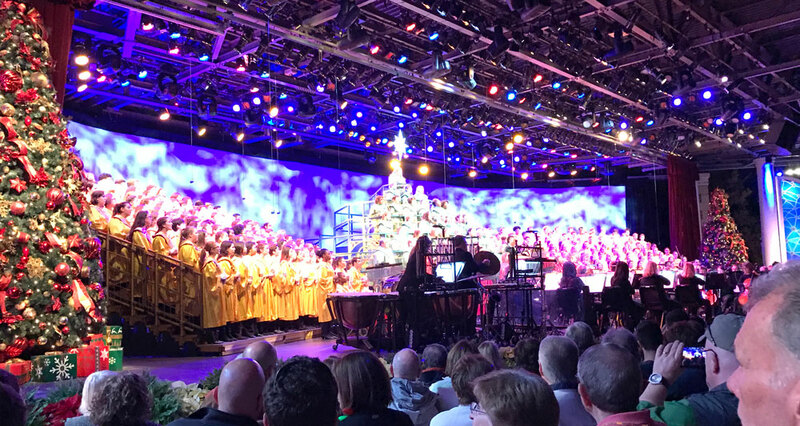 The school’s Concert Choir performed with three other high school choirs — and professional singers and an orchestra — in Disney’s famous Candlelight Processional at EPCOT, Friday evening. The Unionville High School Concert choir got the opportunity to share the stage with other high school singers, professional musicians and guest narrator Whoopi Goldberg. Along with the professional musicians, Unionville’s singers got the opportunity to share the stage with the evening’s celebrity guest narrator, Whoopi Goldberg. The Choir performed twice in front of thousands of people — many of whom waited quite a bit of time to get into the much-beloved show, which dates back to an original show at Disneyland roughly 50 years ago. The Choir performed about a dozen songs in each of two very well received performances. In between performances, the students got the opportunity to spend fun times in the various theme parks before returning home Sunday afternoon. To see video of some of the performances, check out The Unionville Times’ Facebook page.